Tattooing, though usually thought of as a piece of body art that will stick with the wearer for the rest of his life is sometimes lasts for even less time than a broken bone. 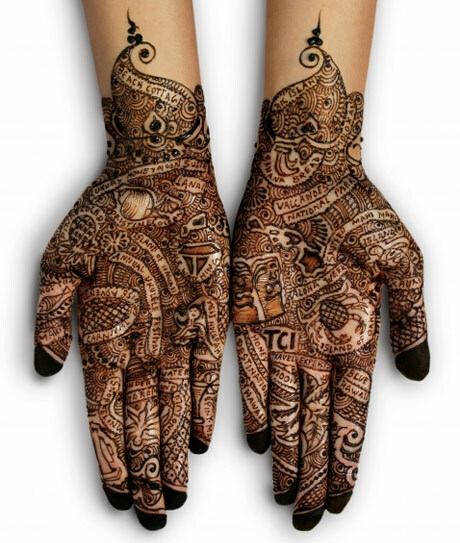 The ancient Indian body art practice known as Mehendi, or henna tattooing, used to be part of the preparation a woman would go through before she had a special event, such as a wedding or religious ceremony, to attend. Though traditionally henna tattooing was only for women today men and even children can receive a henna tattoo. Henna ink is actually a paste made from henna plants and is completely organic and pain free (http://www.hennaweb.com/). The paste is applied to the skin, usually in traditional designs wrapping around the wrists, forearms, hands, and top of feet. The paste is then allowed to dry and is then easily brushed from the skin leaving only a dark mark on the skin which it directly touched. These elaborate and pain-free tattoos do have one down side if someone especially desires to keep the design on their skin, they fade and over time, usually about a month, they disappear completely from the skin leaving no trace. Though it is possible to get an original design with henna the majority of henna tattoos are done with traditional designs. The traditional henna designs though do not just come in set patterns that are just stenciled on the recipient, they can range from the relatively simple, such as a swirling patterned ring around one's wrist and hand, to extremely intricate designs which can cover the entirety of one's hands and feet. "Henna Artisans." The Henna Tattoo People. 27 Mar. 2009 .